This history of the Austen family was published in 1983 and did not come to my notice until I ran across a copy of it in a used bookstore in downtown Richmond. I hadn’t heard of it prior to finding it on the Literary Criticism shelf, nor had I seen it referenced. It’s a gem of a book, only 200 pages, filled with details of the Hampshire Austens, both Jane’s generation and that of her parents and aunt and uncles. So much has been written of Jane herself that her siblings and parents, as well as her aunts and uncles, tend to be omitted. They should not be, however, as it was their foibles, successes, quick wit and senses of humor that contributed to Austen’s writing in the first place. This book is a great reference for details of the Austen children’s lives. Each of the brothers is outlined in his own chapter; Holbert Tucker explores each of their careers, marriages, and their reminiscences of their sister, Jane. Sadly, Jane was the first of the Austen children to die, so each of her siblings was left to memorialize her in his or her own way. Much is made of James Edward Austen-Leigh’s MEMOIR OF JANE AUSTEN, especially in that Jane’s nieces and nephews were its author’s chief collaborators in providing first-hand accounts of their playful aunt. 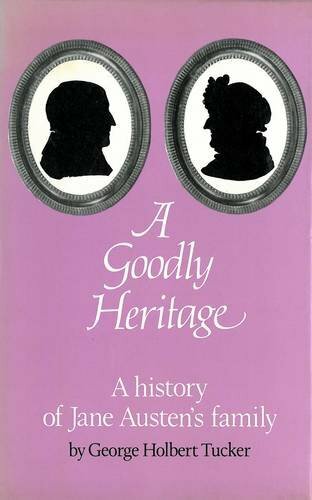 HERITAGE is a great collection of family information, wonderful for a first time reader of the Austen family’s history.